25 fabulous bloggers, authors and publishers have joined with me to offer you one fabulous prize. 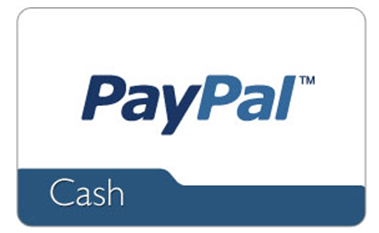 1 lucky winner will win $250 in Paypal cash! REFLECTION (A Whitney Steel Novel) is on sale for $0.99 (reg. 3.99) for a limited time! 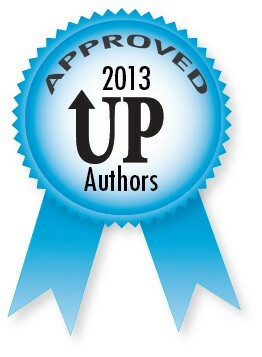 RomCon® is the premier FAN convention for romance readers in the world. **Enter to win 1 of 2 great prizes. 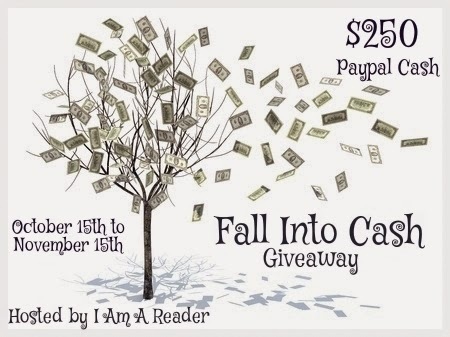 Winner’s choice of a Kindle Fire HDX or $229 Amazon Gift Card or $229 Paypal Cash! **The first prize is available via the rafflecopter below. The 2nd is available only to bloggers who post about this giveaway. You can find info on how to enter the 2nd giveaway in the rafflecopter. 1 winner will receive their choice of an all new Kindle Fire 7″ HDX (US Only – $229 value), $229 Amazon Gift Card or $229 in Paypal Cash (International). There is a second separate giveaway for bloggers who post this giveaway on their blog. See details in the rafflecopter on how to enter to win the 2nd Kindle Fire HDX 7″, $229 Amazon Gift Card or $229 in Paypal Cash. Open only to those who can legally enter, receive and use an Amazon.com Gift Code or Paypal Cash. Winning Entry will be verified prior to prize being awarded. No purchase necessary. You must be 18 or older to enter or have your parent enter for you. The winner will be chosen by rafflecopter and announced here as well as emailed and will have 48 hours to respond or a new winner will be chosen. This giveaway is in no way associated with Facebook, Twitter, Rafflecopter or any other entity unless otherwise specified. The number of eligible entries received determines the odds of winning. Giveaway was organized by Kathy from I Am A Reader and sponsored by the participating authors & bloggers. VOID WHERE PROHIBITED BY LAW. “Who doesn’t like a good thriller, a cat and mouse chase to the death, a great plot and strong, vital characters? Did I mention the sick and all powerful business mogul who is dabbling in illegal human cloning? 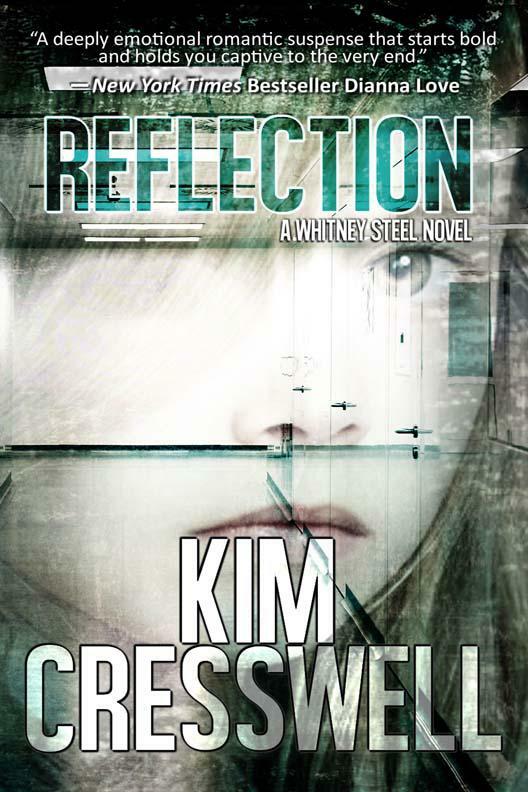 Reflection by Kim Cresswell had me from the introduction of the gutsy investigative reporter, Whitney, beautiful, damaged and determined to make it HUGE in a predominantly male world. Lunch with the ex is not always a fun thing, but when bullets start flying around Whitney and her ex-husband, a prominent politician and she receives a cryptic message from him as he lay dying, her life a she knows it is about to do a complete one-eighty as she finds herself in the middle of a story that will rock the world, providing she lives long enough to get her byline. An undercover FBI agent, Blake has been working for the eccentric mogul Nathan Shaw as head of security, together, while still keeping his identity secret, Blake and Whitney are determined to do two things, bring Shaw down and stay alive. But is Shaw the only one after Whitney, or is he like a puppetmaster pulling enough deadly strings to get make staying alive impossible for anyone close to Whitney? Has a human been cloned? Can Shaw be taken down? Will all of the threats be neutralized? The September Kindle Fire Giveaway is here! 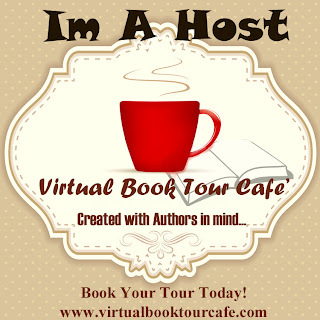 This is a joint AUTHOR & BLOGGER GIVEAWAY EVENT! 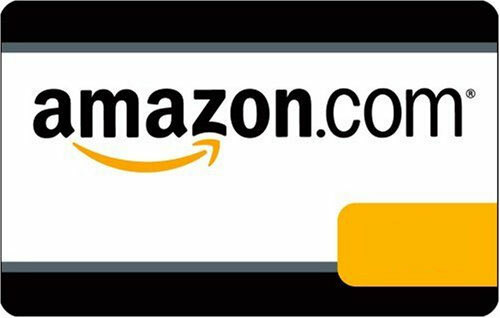 1 winner will receive their choice of a Kindle Fire 7″ HD (US Only), $199 Amazon Gift Card or $199 in Paypal Cash (International). There is a second separate giveaway for bloggers who post this giveaway on their blog. See details in the rafflecopter on how to enter to win the 2nd Kindle Fire. 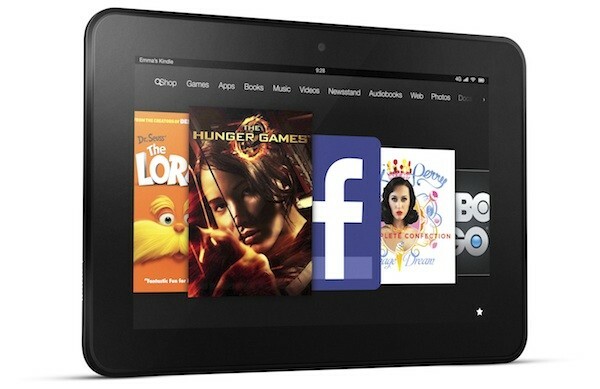 Sponsor a future Kindle Fire Giveaway. Details can be found here. Open only to those who can legally enter, receive and use an Amazon.com Gift Code or Paypal Cash. Winning Entry will be verified prior to prize being awarded. No purchase necessary. You must be 18 or older to enter or have your parent enter for you. The winner will be chosen by rafflecopter and announced here as well as emailed and will have 48 hours to respond or a new winner will be chosen. This giveaway is in no way associated with Facebook, Twitter, Rafflecopter or any other entity unless otherwise specified. The number of eligible entries received determines the odds of winning. Giveaway was organized by Kathy from I Am A Reader, Not A Writer and sponsored by the participating authors & bloggers. VOID WHERE PROHIBITED BY LAW. 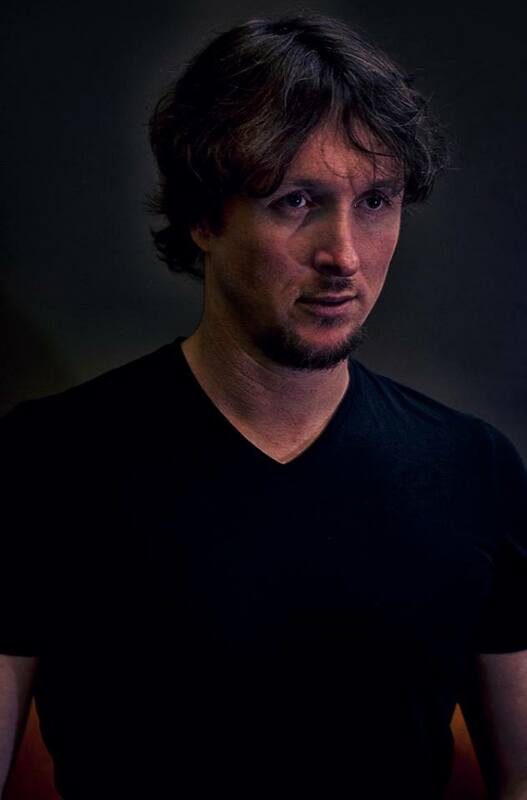 Jonathan Benton always wanted to write books, having won first place in a short story competition when he was ten. Inspired by writes such as Ray Bradbury and Stephen King, Jonathan first discovered the crossover genre of literary/fantasy while reading Bradbury’s Something Wicked This Way Comes. Jonathan grew up in New Zealand, dreaming of travelling to London and finally making the pilgrimage in his mid-twenties. Returning from England, he settled in Australia, the country he now calls home, and decided to take his writing seriously. Robert Duncan no longer believes in magic. A mysterious call about a blood moon, however, leads him back to the magical world of his childhood and to Luthien, the beautiful girl with flame-coloured hair, who he loved and lost. A Wicked Kind of Dark mixes vast and spectacular fantasy landscapes with gritty urban reality. A must-read for people of all ages who believe in the power of imagination, and the importance of never losing touch with your inner child. *An additional $10 Amazon Gift Card or Paypal Cash is available to anyone who shares this giveaway on their blog. See link in the rafflecopter form. 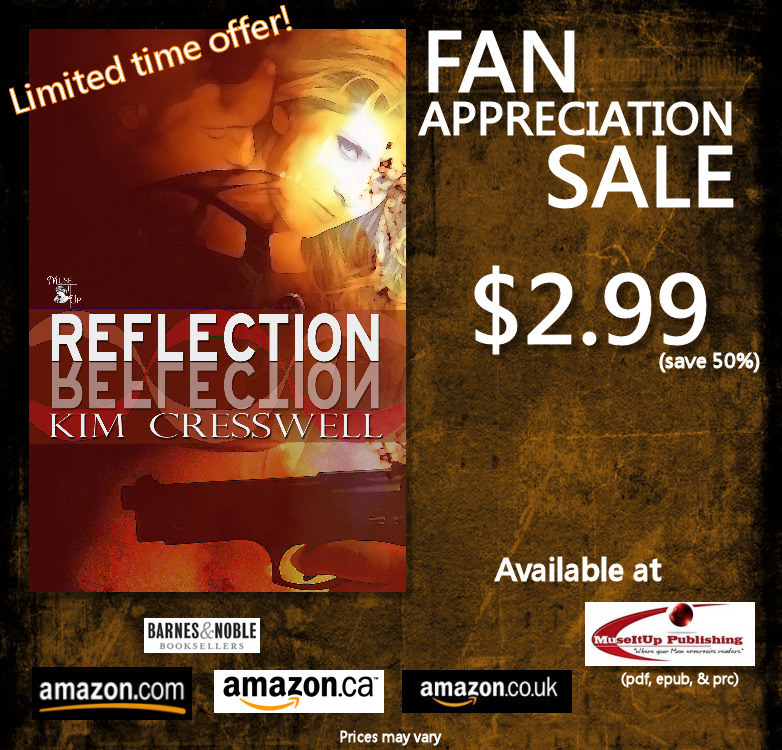 Because I appreciate each and every one of you, I’m thrilled to offer REFLECTION at almost 50% off the regular price! If you are looking for a hot summer read, now is the time! A reporter’s determination to expose an illegal human cloning project places an innocent child in the crosshairs of a master criminal. Also, watch for another fantastic Kindle Fire giveway coming soon! 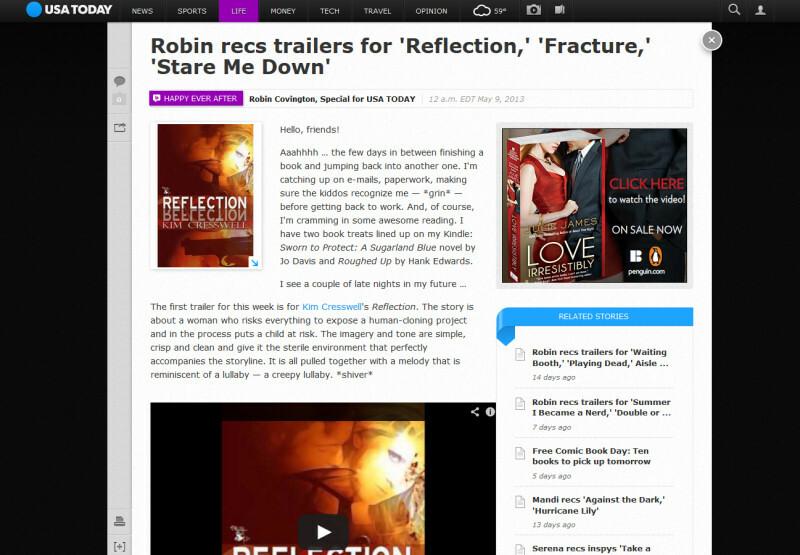 May 2013 – The book trailer for REFLECTION was featured in Robin Covington’s, Happy Ever After, Special for USA TODAY! Check it out here! A huge thank you to Robin! June 2013 – REFLECTION received a 5 star review on page 71 of BTSeMag! 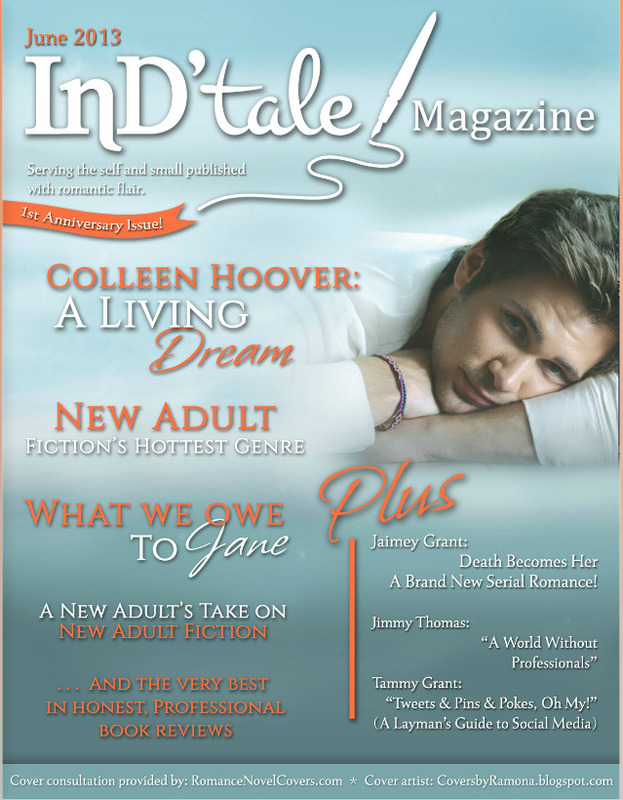 Click here to read the magazine! 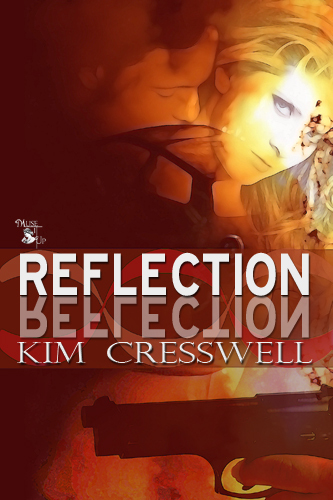 A pulse-pounding opening is just the beginning of the non-stop action in Reflection by Kim Cresswell. Whitney Steel is a headstrong investigative reporter who wants to expose the truth at all costs even while falling for Blake Neely, an undercover FBI Special Agent. As they work to take down an evil billionaire, the romantic tension builds until they give in to their desires. But, is a physical relationship enough for Whitney when she believes Blake is keeping something from her? Watching Whitney and Blake’s struggle to trust each other makes them an intriguing couple. Meanwhile, Cresswell works multiple storylines with stunning plot twists that keep the pages flying by. Completely captivated with this romantic suspense, I could barely take a breath before reaching the high-octane climax. Cresswell masterfully ties up the major plot points while leaving the door open to revisiting these characters again. I, for one, hope she does. 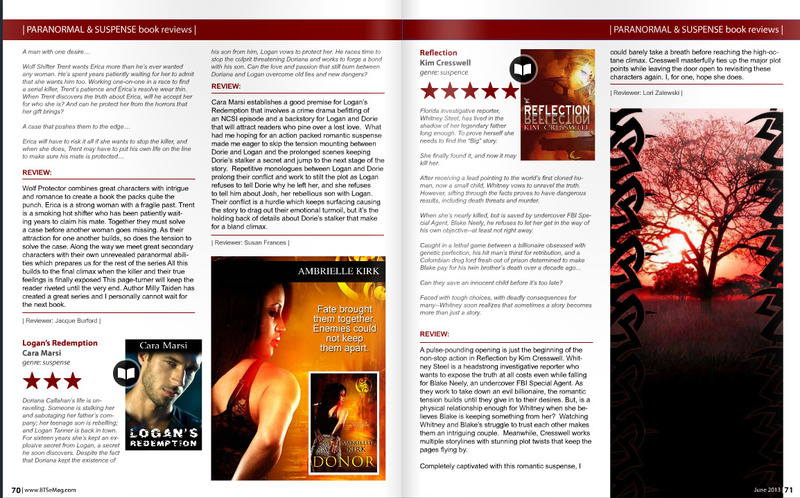 June 2013 – REFLECTION reviewed a stellar 4 star review by InDTale Magazine! Click here to read the full review! How many times had Whitney Steel heard those words? Dozens. But never from the mouth of a United States senator. For all she cared, the man could drink himself to Mars, but not until she got what she’d come for. An exclusive. Under the awning shading the Pink Flamingo Club’s patio, she took a sip of her lime daiquiri, and couldn’t help notice the way the mid-afternoon sunlight brutally magnified every line on Mason’s tanned face. “Of all the reporters in Panama City, let alone Florida, why me? We cut our ties years ago.” And our losses, she wanted to say, but didn’t. Whitney straightened. Anger coiled in the pit of her stomach. “Give me a break. For a year and a half, I thought we were married. Too bad your girlfriends didn’t know about our little legal arrangement.” Especially, your twenty something assistant. Her heart thumped with anticipation. This story would be the topic du jour for months. Her ratings at WBNN-TV would soar, and finally her colleagues would take notice and treat her with the professional respect she deserved. For the past twelve years, her colleagues said she’d had a free ride because of her father, an award winning war correspondent, and her ex-husband’s political connections. This time she’d prove them wrong. Brown eyes that once set her heart hammering now conveyed a chilling,hollow look. Was it guilt? Desperation? “Thank you. That means a lot to me.” He reached for his empty glass and tapped his chunky gold ring against the side. Whitney turned the recorder on again. He opened his mouth to answer. The large window behind them dividing the patio from the main restaurant exploded. A storm of glass rained down, showering the patio. There was no warning. Everything moved so fast, yet in slow motion as if part of a horrid nightmare. Screams. Rushed, heavy, thumping footsteps. A few feet away, a male waiter dropped the two plates of food in his hands. He froze. Whitney dropped. She huddled into a ball under the table and squashed the side of her face against the patio stones. Amid the chaos, a gunshot echoed and the waiter ran for cover. A bullet ripped through the man’s shoulder and spun him around, the force slamming his body against the restaurant door. He folded to his knees and howled out in pain. More shots rang out. Debris spewed through the air. Food, glasses, plates. The sickening smell of deep fried food and scorched cordite assaulted her nostrils. She gagged. Crimson snaked toward her hand. The warm, sticky liquid met her fingertips. Blood. Lots of blood. But it wasn’t hers. Her gaze snapped to Mason, lying on his back. Dark red blood pumped from a gaping wound in his chest, soaking his white shirt. She held her breath to keep from screaming. Another bullet whizzed through the air and slammed into the bottom of the wooden table leg. Needle-like splinters from the wood slashed through her pants and drilled into her thigh like a hundred slivers. The pain knocked the breath from her. The world twisted and turned yellow. Darkness thickened and threatened to overpower her.